Nothing to see here: just a call from Chris Evans. Apple is having some fun with frenzied fanboys and gals ahead of today’s “It’s show time” media event. 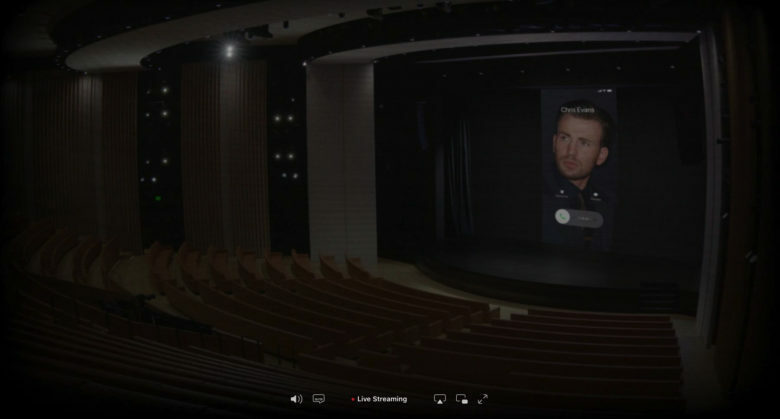 Although the live broadcast won’t officially start until 10 a.m. Pacific, Apple “accidentally” showed a few images of the empty auditorium. What makes that particularly exciting? Only the fact that the screen is showing images such as an incoming call from “Captain America” star Chris Evans. Evans will play the lead in Apple original series Defending Jacob, based on a best-selling 2012 thriller novel of the same name. This is Evans’ first non-movie role since 2000. He will star alongside Downton Abbey‘s Michelle Dockery and It actor Jaeden Martell. Other Apple teases of the event have included a CarPlay dash display of someone taking the drive from Los Angeles to Cupertino. There has also been an audio quote from M. Night Shyamalan, another Apple TV series creator, among others. Apple is reportedly planning to have big stars in attendance for today’s event. This isn’t the first time Apple has been willing to offer teases ahead of its big keynote reveals. Before last year’s iPhone event, CEO Tim Cook tweeted out what looked like an erroneous DM for the world to see. “No. Who can get it here quickly?” was all Cook wrote. In the end, it turned out to be the setup for an opening skit in which Cook needed the clicker for his presentation. This month, Apple went on a brilliant weeklong PR blitz to drum up publicity for the March 25 event. A few teases of its new shows isn’t quite as exciting as new iPads (which we got last week). But it’s still a way of keeping anticipation high. Just don’t believe for a second that what you’re getting is an actual accidental live stream of the event. For more information on how to watch today’s event, check out our post. You can also tune into the live stream here to see if anything is showing!